There were 2 unactivated areas in PA left. One is on an island and therefore out of my reach. The other one is about 150km driving from my QTH. 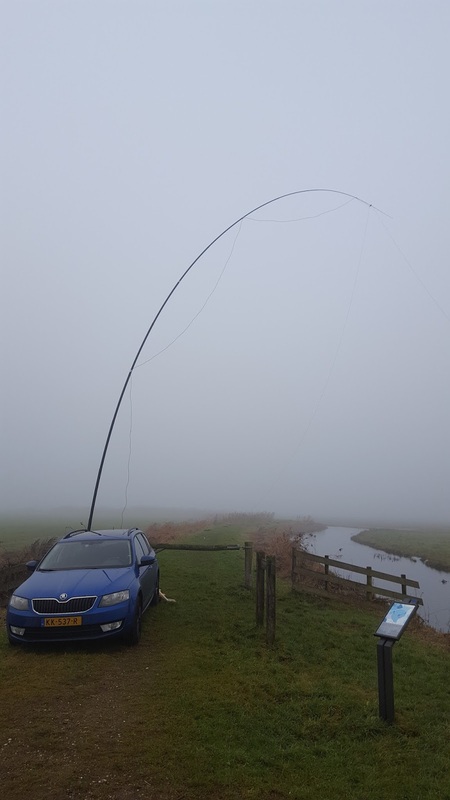 I decided to go for that one for my last activity in 2016: PAFF-0094 Sneekermeergebied. The day started out cold - the first challenge was to get the car windows de-iced. While travelling up north the fog became more and more dense. My plan was to stay in PAFF-0094 for a few hours and then perhaps activate another area on my way back home. 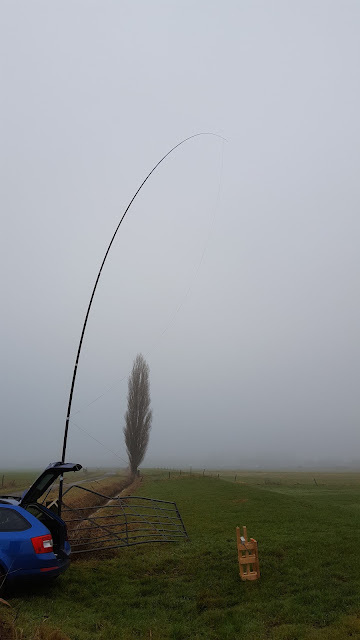 I took my new 26m pole to test it out in the field for the first time. It turned out I didn't need the support I completed in a rush yesterday, as the gate - visible behind the car - was strong enough the hold the pole. However I ran into a challenge.. with the smaller poles (12m, 18m) I just extend the segments as far as I can. The friction then holds them into place. To secure them I sometimes use some duct tape. This works perfectly for a few hours. With the new pole I found that the segments - when they are brand new - are lubricated. This posed two problems: it was impossible to extend them fully as there was no way to put any really force on the segments (my hands would just slip) and the duct tape would not hold. 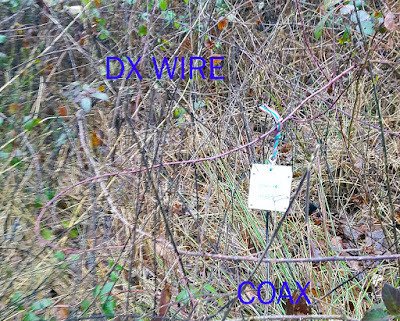 So after spending half an hour on this experiment I took out my tried and trusted 18m pole and set up the end fed half wave wire for 40m. It works on 20m as well, and that is where I started. 20m was very quiet. Tuning around I heard few stations. I logged 14 chasers in 15 minutes but mainly with average to poor signals. So I moved down to 40m. The band was not very busy but I greeted 60 chasers in 45 minutes nonetheless. 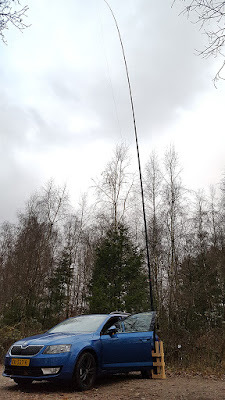 I went back to check on 20m but it still was not really going strong. So I went back to 40m to log another 74 chasers in just under an hour. With the bands in this shape and the cold wind that had picked up, I decided I would not drive to a second area today. So I set up my inverted v for 80m to give chasers on short skip a chance. 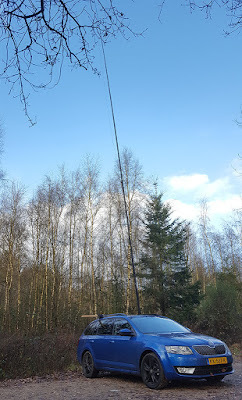 The wind made it a challenge but I got the antenne up - not as high as I would have wanted.. Using my tuner I was able to give 60m a try on this antenna. I never used that band before on a WWFF activity - in fact I have hardly used that band at all. I logged only 4 chasers but gained a "new band dxcc" as I logged one DL station. Then I went to 80m to log 11 chasers - mostly short skip. 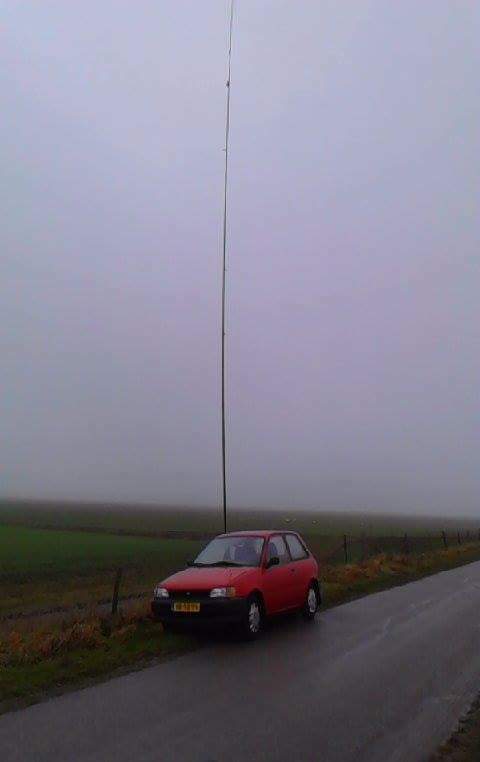 I still had a little bit of time left, so I changed the antenna once again. This time I put up the EFHW for 20m, hoping to catch some NA (there are avid chasers there like Bill W1OW). It was still slow on this band but conditions seemed a bit better than earlier in the day. In the next 40 minutes I copied just three NA stations - including Bill of course - from MA, NC and MO. The big surprise however was HB9KNA working from YS1. He was beaming long path to Europe - almost 31.000 km. The signal was strong both ways with 58/57 and this contact was an atno for me. Nice! TL;DR - 219 logged calls from 39 DXCC in about 3,5h - only 8 calls from outside EU - odx YS1 via lp. 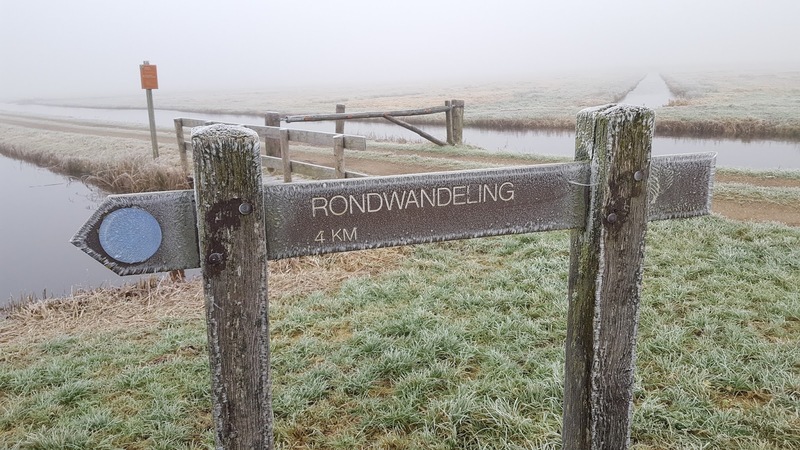 This morning I went out to activate PAFF-0055 Deelerwoud using my temporary callsign PA44FF. Weather was okay with some drizzle but almost no wind. I arrived at the nature reserve rather early (for me anyway) at 8am UTC. 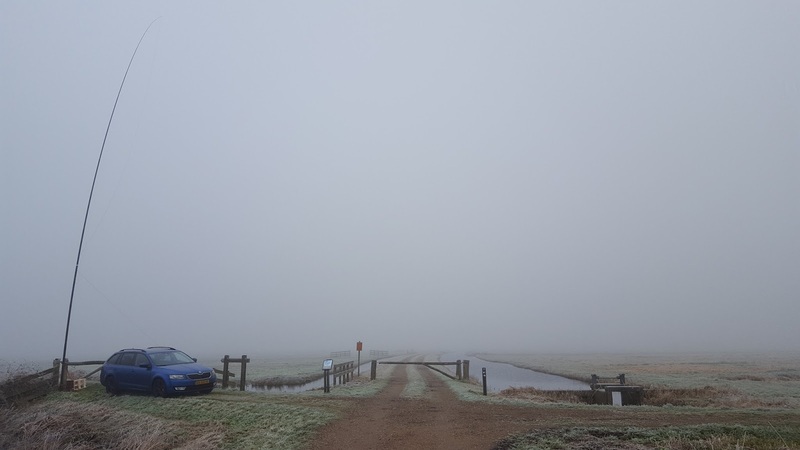 To my surprise there were already quite a few people out in the reserve. I started on 40m using a half wave end fed almost completely vertical (20m long on an 18m pole). I brought my Ameritron mobile amp as I was expecting bad conditions - forecast had been rather poor. It turned out there was an Italian contest going on that completely filled 40m with s9 signals. Luckily I found a spot at the end of the band around 7.198.000 I stayed there for about 40 minutes logging almost 60 chasers, until I could not bear the QRM anymore. Higher bands seemed rather dead so I focused on 20m next. 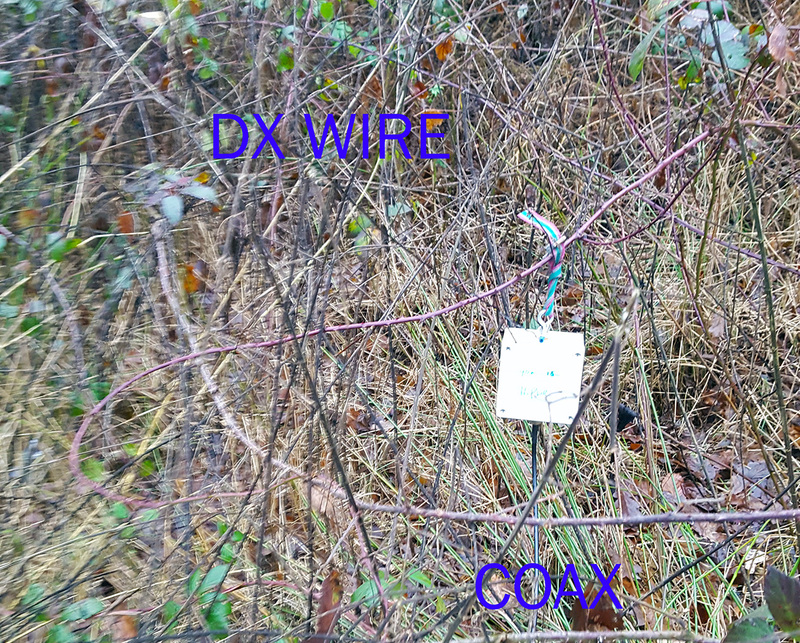 It was really lively on 20m but DX was sparse. The next 2 hours I did not have time to enjoy my sandwiches and just enough to sip my coffee once a while. I logged over 200 calls in under 2 hours on 20m. DX included 4Z, R9, OD5 and to my surprise JA. Before packing up I decided to give 40m one more try. It was even worse than earlier in the morning. The FT857's filtering is rather basic but with one big wall of sound all over the band I think there was not much to gain anyway. I gave up trying and went down to 80m. The antenna is not very effective on this band but I did log 4 chasers. 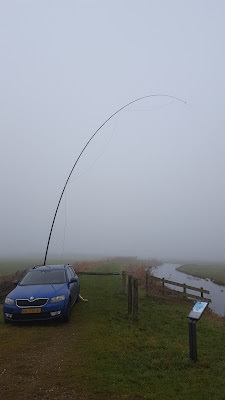 I went back to 40m, hopped over the band trying to find some gaps at the lower and upper end. Including the short diversion to 80m I lost about 45 minutes. When I found some usable spots in the end I logged another 30 chasers in the last half hour. In total I was busy for about 4h. Subtracting time for antenna changes and finding spots on 40m I was really QRV for 3h. In that light the 296 calls from 39 DXCC I logged is quite a lot. If it weren't for the contest on 40m, I am sure I would have logged a lot more chasers on that band. The band actually seemed quite good (hence the strong contest signals). Judging from the 2h continuous stream of chasers on 20m, it seems that the special call does attract some extra attention. The fact that it was Sunday morning might have contributed as well (I am not that often active /P during weekends). Anders SA2CLU inquired about my set-up today. So I will just add two more pictures. The first one is just to show how effective something small can be. 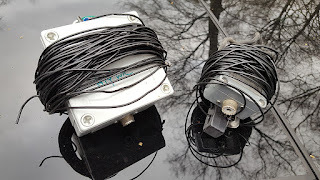 These are the two antennas I used: end fed half wave antennes for 40m (home brew) and 20m (commercial). They are only small if you forget about the Spiderbeam pole I am using of course. The 18m pole does attract a lot of attention from passersby. The 40m antenna is just a bit too long for the 18m pole. So I slope the last bit of the wire away from the pole. It ends up where ever I can attach the transformer. This time just 30cm or so off the ground. In the first picture on this page you can just make out the transformer box in the bushes behind the car. Below a zoomed in picture of this simple set-up.